The National Institute for Staff and Organizational Development (NISOD) has assembled an outstanding collection of workshops designed for community and technical college educators. Regional Workshops bring together educators from around your area to network, be inspired, and learn best practices from one another. Would your college like to serve as a co-host college for a Regional Workshop? Ideal host sites are those with several other community and technical colleges within a relatively short driving distance (3 hours or less). In exchange for serving as a co-host institution, workshop participants from your college receive a deep registration discount! Although other arrangements can be made, Regional Workshops are typically held on a Friday from 10:00 a.m. – 3:00 p.m. with a 12:00 – 1:00 p.m. with lunch provided by NISOD. NISOD provides the lunch either through the co-host college’s culinary program or a local caterer. 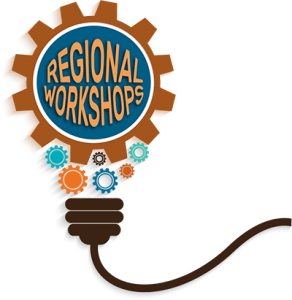 The Early Registration Deadline, at which time a determination will be made regarding whether a Regional Workshop “makes,” is approximately 30 days prior to the scheduled Regional Workshop date. NISOD manages all pre-workshop and onsite registration logistics, including hosting the online registration and other web page. NISOD contracts with the Regional Workshop facilitator and pays and reimburses him or her for travel and other expenses. The co-host college and NISOD work together to identify an ideal date for the workshop. The co-host college and NISOD work together to select a workshop topic. The co-host college provides a projector, screen, and, depending on audience size, possibly a microphone and speakers. Wi-Fi is preferred, but not required. The co-host college assists in promoting the workshop to other institutions in the area. Provide your college’s faculty, administrators, and staff access to a cost-effective, high-quality, and high-impact learning experience! Please contact Edward Leach at ed@nisod.org or (512) 232-1430 for additional information or to arrange to have a workshop brought to your region. Regional Workshops supplement NISOD’s offerings of professional development programs and resources, which culminate with NISOD’s Annual International Conference on Teaching and Leadership Excellence held every Memorial Day weekend in Austin, Texas. NISOD’s annual conference is noted as the premier convening of community and technical college faculty, administrators, and staff who strive for excellence in leadership, teaching, and learning. For more information about NISOD’s conference or to register, visit www.nisod.org/conference.